Lime Kiln State Park covers a stretch of the low rocky shore on the west side of San Juan Island. This old lime quarry is a popular place to whale watch, picnic and hike. 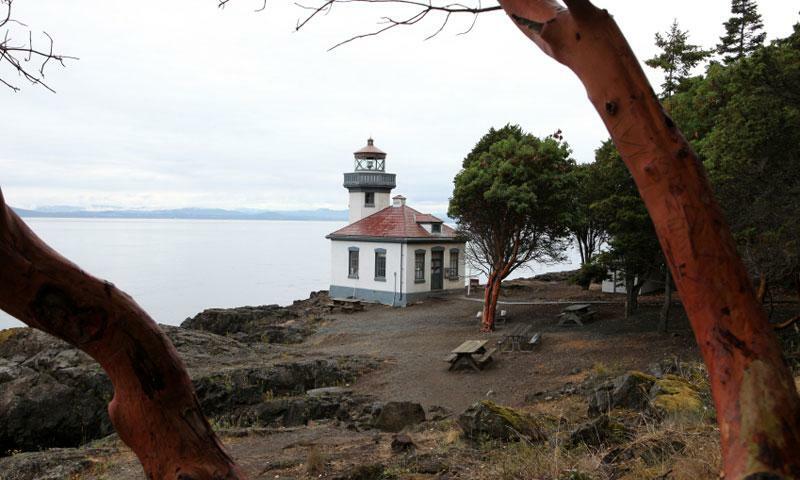 What can I see and do at Lime Kiln State Park? The waterfront picnic tables and trails look out over Haro Strait, which is a common place to spot passing orca whales. The nearby picturesque lighthouse makes its way onto postcards for good reason. You can make the short walk to the shore easily or strike out along the paths that crisscross the shore and forest. The Park property is adjacent to even more public land so you can wander for quite some time on the rough paths. Try heading uphill from the old kiln at the north end of the Park. You can get some amazing views from the higher rocky bluffs. Where is Lime Kiln State Park? Located along the west side of San Juan Island. From Friday Harbor head west on Beaverton Valley Road this will turn into West Valley Road. Take a left on Mitchell Bay Road and another left on West Side Road. This Road will lead you right to the Park, which will be on your right. When is Lime Kiln State Park open? The Park is open for daytime use all year long. It can get busy around the parking lot during the summer but if your head north along the water you can usually find your own piece of shore. How much does Lime Kiln State Park cost? Vehicles must have a Washington State Parks Discover Pass. However if you walk or bike in you don’t need one. The Pass can be purchased for $10.00 a day or $30.00 for the year. The State Park information line can answer all your questions. (360) 902-8844.